Humidity theory has been on my mind for a long time. Recent work has advanced the idea that something in the climate apart from temperature is having a major impact in governing the way grapes and wines reflect their local environment. Humidity, and in more technical terms potential evapotranspiration (ETo), determines how much stress a grapevine will suffer in the course of a growing season.The new way to express this relationship is a climogram plot of growing season temperature (GST °C) vs. aridity index (AI) which is based on evapotranspiration and rainfall. 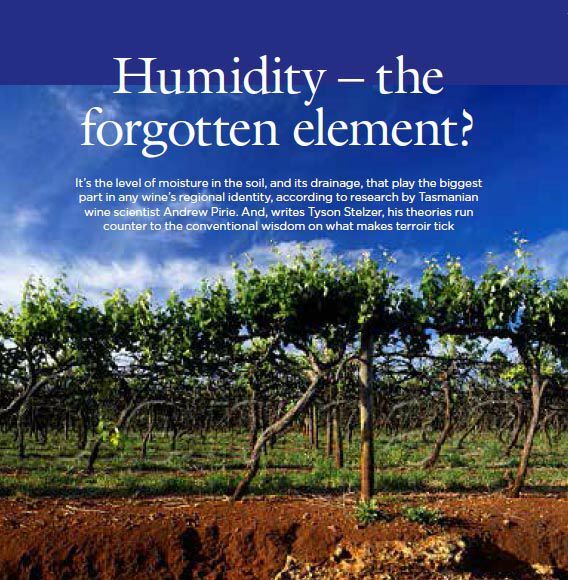 Read this article in Decanter August 2016 : "Humidity- The Forgotten Element"
I have spent a number of years looking for causal relationships between the vineyard environment and wine style. This work is coming to the conclusion that the imprint of place is due to both seasonal temperature and to how much water stress a vine experiences during the growing season.